1) Preheat oven to 325ºF and line two baking sheets with parchment paper (or grease lightly) or silicone mats (may increase baking time a bit). Thoroughly mix salt, ammonium carbonate, and 1/4 cup sugar together in a small bowl. 2) Beat butter briefly to soften. Add remaining 1 cup sugar to butter and beat at medium speed until light and fluffy. Add the ammonium carbonate/salt/sugar mixture and beat for two minutes. Beat in almond extract until combined well. Scrape down the sides of the bowl. 3) Add flour and beat at low speed (or mix by hand) until most of the flour is incorporated. Add the coconut and finish mixing, breaking up any coconut lumps. If the mixture is very crumbly, use your hands to knead the dough until smooth and cohesive, but try not to overdo it. The dough will adhere to itself when you start shaping it. 4) Form the dough into 1 1/4-inch balls. Place on prepared pans about an inch apart and bake for 22 to 26 minutes or until light golden brown around the edges. 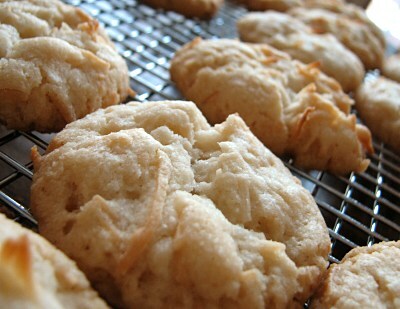 Remove cookies from pan and cool on rack. Store in airtight container. This entry was posted in Baking, Holidays, Photos by Annie. Bookmark the permalink. i love your blog! i found it via your award winning “spoon swoon” post. please post more! i keep checking my livebookmark/feeds. do update soon! lisa: Thanks for reading! I’m swamped with personal projects right now but hope to increase the posts in spring. There might be one or two yet this winter though. What a great photo, those dream cookies look delicious. I copied the recipe so I can make them this week. Minti: I read that a while ago and forgot all about it, thanks! Chuck: I hope they turn out great. I’ve been making this cookie since it was published in gourmet about 7 years ago. It is wonderful and a favorite with everyone I know. I’ve been told and also read that that the ammonium carbonate does not have a long shelf life and that it should be replaced every year. Thought I might share this, so that you don’t put in the work of making the cookies only to have them come out flat. Those cookies sound delicious! I might try it out myself. Kate: Thanks for the heads up! Especially since I don’t make these often.